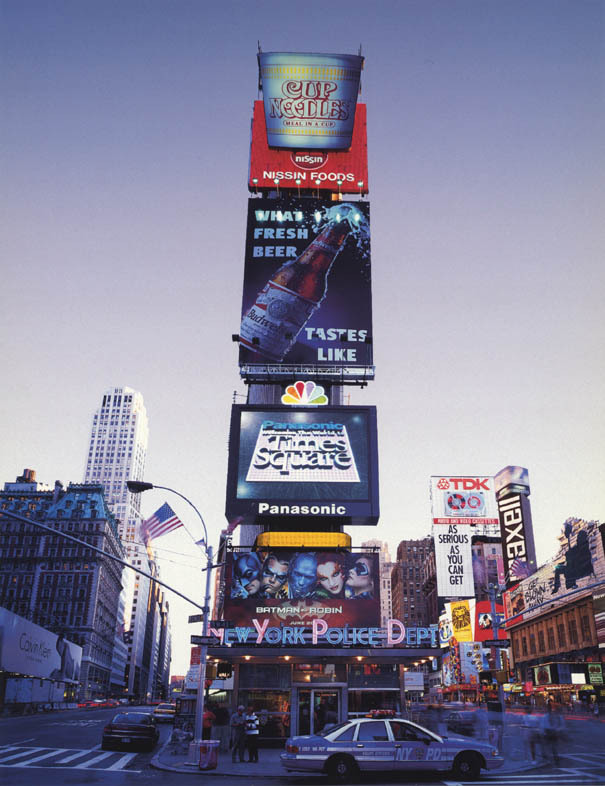 In July 1996, the magazine Businessweek�offered a status report on the redevelopment of Times Square, which - more than a dozen years after the designation of Park Tower Realty as the developer of The Times Square Center and the announcement of the Johnson & Burgee design - at last finally seemed poised for real progress. "A Star Is Reborn: Investors Hustle to Land Parts in Times Square Transformation," July 07, 1996. By Anthony Bianco, Businessweek. After the collapse of the 42DP in August 1992, the four skyscraper sites were put on the market by Prudential, which had become the major investor after partnering with Park Tower Realty. Over the next decade, four different companies and their architects developed individual towers, though the design of all buildings was still overseen by the Urban Development Corporation (UDC) guidelines. Installation view. Four Times Square Model. collection of The Durst Organization. The first to commit to construction was 4 Times Square (later called the Conde Nast Building),�developed by The Durst Organization (left). �The site on the corner of�the east side of Broadway was the largest of the four created by the 42DP and it accommodated a building envelope of 1.6 million sq. ft. Construction began in 1996 and was competed in 1999. 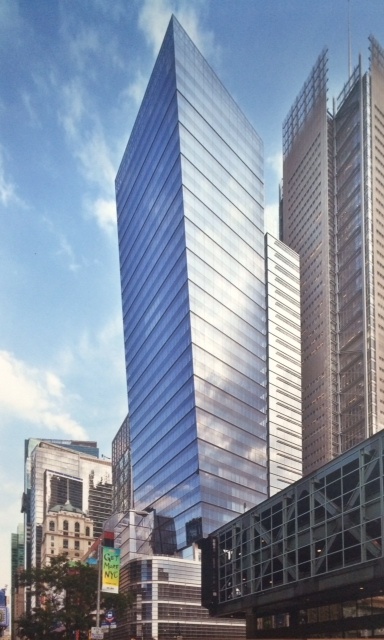 The photograph on the left, of the Times Tower serving as an armature for signs, illustrates how even in the late 1990s the 42DP corner sites remained low-rise. The undated and uncredited image was included in a real estate prospectus prepared by Lazard Freres. On the right, The same view in 2004 shows the open sky now filled with more than 4 million sq. ft. of new office space. 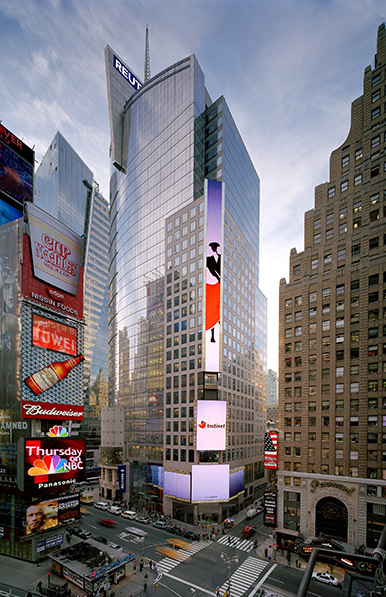 The architects Fox & Fowle also designed two other major towers on 42DP sites: 3 Times Square, the Thomson Reuters Building, developed by Rudin Management, and 11 Times Square, the last skyscraper of the project, built by SJP Properties, completed in 2011. 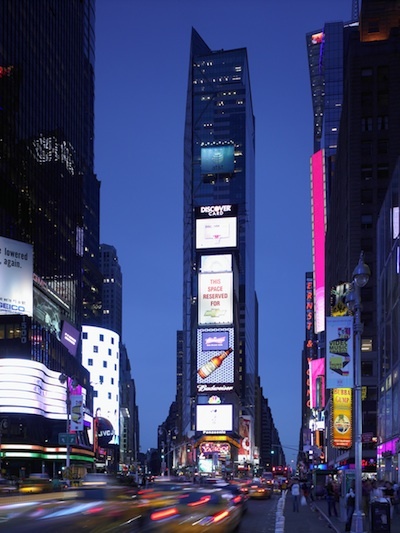 On December 3, 2010, the headline of a New York Times real estate article by Charles Bagli proclaimed: "After 30 Years, Times Square Rebirth Is Complete". Occasioned by the completion of 11 Times Square - the final parcel of the 42DP's project to be developed, Bagli's excellent summary article recounts the ups and downs of three decades: "The plan, to radically make over 13 acres, between Broadway and Eighth Avenue, primarily fronting 42nd Street, outlived three mayors, four governors, two real estate booms and two recessions. It faced widespread derision in the beginning from jaded New Yorkers who were wise to grand plans."